I found this music paper in my stash and used the embossing folder that came with this bird stamp. I sponged colors on the embossed areas. This stamp and embossing set came in a magazine. The saying is from Sparkle N Sprinkle. This is for the B prompt for the Feb. Christmas challenge. I have this stamp and embossing folder from the magazine! 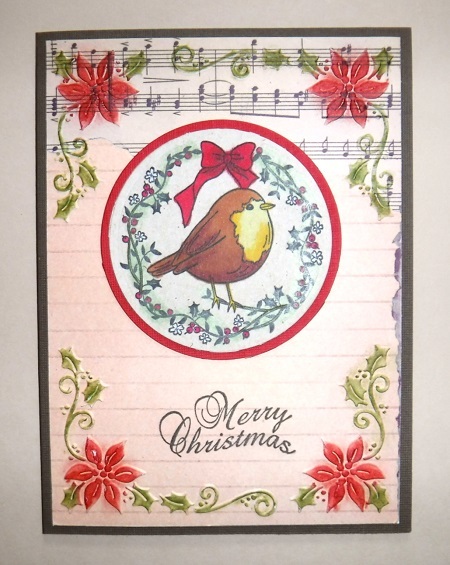 Your card turned out great, I like the coloring on the bird and embossing. The embossing over the music paper is so pretty! You did a great job keeping the ink on the embossed areas. That is hard to do. Pretty Bird card. I used tiny makeup sponges on a stick to color the embossed areas. They really helped!